There are two trends that I’ve really loved this Summer. Anything approximating a white, broderie lace dresses is one of them (I am very much looking for more opportunities to wear them i.e. when the kids go back to school when I might stay clean for more than ten minutes). And I’m loving ALL the chambray – chambray shirts, skirts, tunics, shorts, pants and, of course, dresses. As I mentioned last week, I’m a big fan of the denim dress. Last week’s style was a more fitted, indigo style, perfect for dressing up or down. Below, I’m wearing a fun, new take on my old favourite – the tectonic dress by Gorman picked up recently in a storewide sale (details below). There’s loads of chambray around town presently and it’s a very good thing indeed. 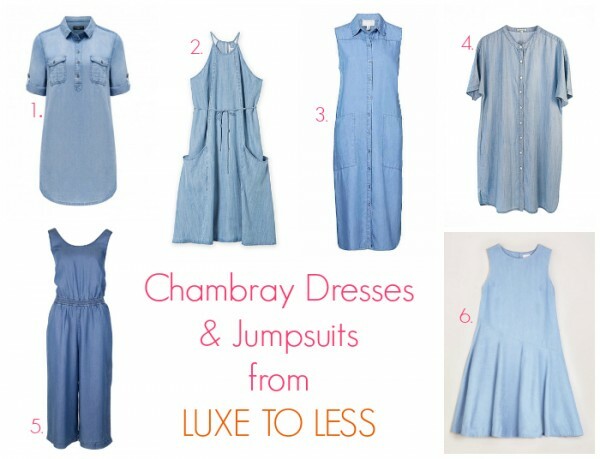 Below, I’ve put together an edit of some of my chambray favourites in store right now, from luxe to less, across a variety of styles. So, if you’re looking forward to your Autumn wardrobe or looking to top up your Summer wardrobe, you’re sure to find something here for you. In the dresses and jumpsuit department, classic shirt styles are great options as are loose and flared styles for everyday comfort. 1. Camille Shirt dress, $69.95 from Forever New; 2. 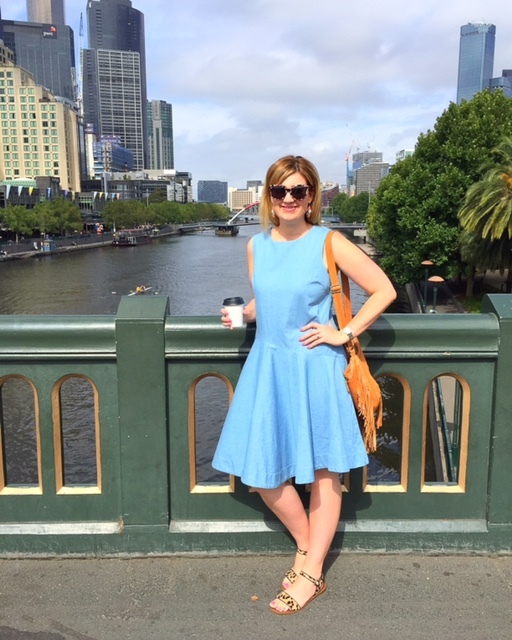 Chambray midi dress, $149 from Country Road; 3. Chambray midi dress, $149.95 from Witchery; 4. Button Down Chambray dress, $149 from Bohemian Traders; 5. Chambray Jumpsuit by Seafolly, $169.95 from Birdsnest; 6. Tectonic dress, $229 from Gorman. 1. Eliana Wrap Shell Crop Top, $19.95 (on sale, limited sizes), from Forever New; 2. Dannii Minogue Petites Chambray Swing Singlet, $49 from Target; 3. Longline Chambray Shirt, $49 from Target; 4. Swing Chambray Cami, $79.95 from Country Road; 5. Chambray Shirt, $99.95 from French Connection; 6. Chambray shirt, $119 from Sussan; 7. High Low Hem Shirt, $129 from Country Road; 8. Tectonic frill top, $149 from Gorman. 1. Belle Curve Chambray Skirt , $39 from Target; 2. Textured Chambray Short, $59.96 (on sale) from Country Road; 3. Belted Chambray Shorts, $69.99 from French Connection; 4. Yas Lyocell Midi Skirt, $79.99 from Jeans West; 5. Summer Drop Crotch Pants, $129 from Bohemian Traders; 6. Chambray pants, $129.95 from Witchery; 7. Tectonic Skirt, $169 from Gorman; 8. Tectonic Pants, $179 from Gorman. – For classic resort style, pair your chambray favourites with white and tan accessories. A pair of chambray shorts for example, paired with a white singlet and simple tan sandals. – If you love a bit of denim on denim action, pair your chambray with a deeper denim, such as indigo jeans paired with a chambray shirt. My friend Kate calls this the Canadian Tuxedo – how hilarious is that! 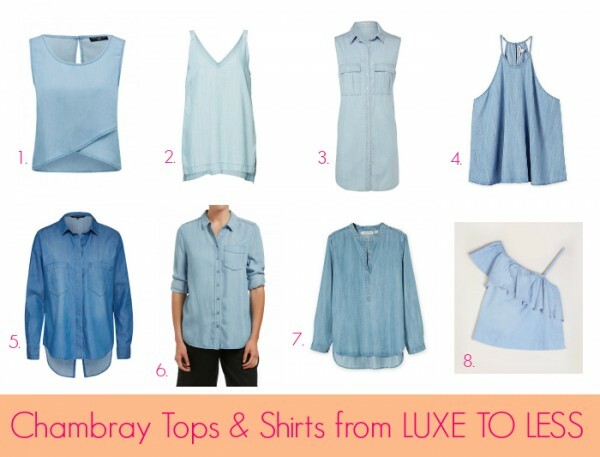 – Chambray, being a neutral of sorts, also works well with metallics and colour. Think rose gold accessories, gold sandals or silver jewellery. Or perhaps some pastel pops or muted tones. – One of my favourite combos is chambray and black for the contrast. Dial it up a further notch with some leopard print as I’ve done above. 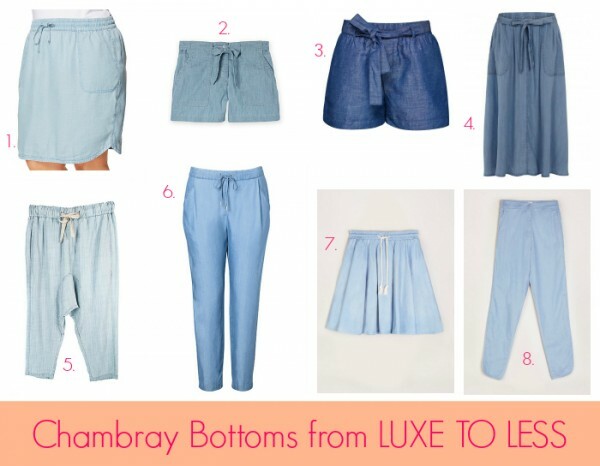 Have you embraced chambray this Summer? How do you style yours?